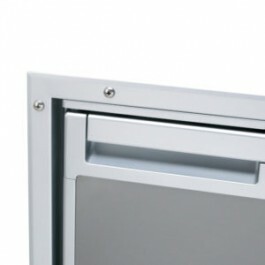 Dometic Waeco Flush Installation Frame CR-110-EFM. Fits Dometic WAECO CR-1110 and Dometic WAECO CRX110 CoolMatic built-in RV refrigerator models. 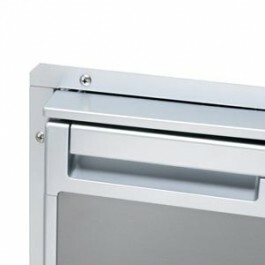 T he flush frame allows the fridge to sit inside the cabinetry and gives a flush professional finish. Dometic Waeco Standard Installation Frame CR-110-EST. Fits Dometic WAECO CR-1110 and Dometic WAECO CRX110 CoolMatic built-in refrigerator models. A perfect fit for my aluminium canopy build. It is lighter than a chest fridge and drop slide, and significantly cheaper. The latches are a bit light and I am a bit concerned they may break in time but overall a much better setup than anything else. Very responsive to questions, the freight company they used at the time let them down a bit, but My Generator chased them up for me a kept me in the loop. I have since used My Generator again for more products for my build. We thought our old fridge was OK until it stopped working, now we realise how noisy it was. The new fridge is so quiet and works efficiently. Very happy with purchase. Very quick efficient service, arrived on time. Very happy to deal with again. "Very good, delivered in good condition"
Excellent, easy to fit and works great. Excellent, no problems at all. Delivered as per the time stated when ordered. An excellent product in quality and price. Early days but product has delivered all that was promised. All questions answered by staff. Delivery was as explained on time. A good all round experience. Definitely would recommend to others. "Excellent unit and exceptional service. " Up till the present I’ve never been keen on Dometic/Waeco products. The original 3way 90litre refrigerater was not my choice for the caravan but it came as a preinstalled unit. Since I installed the Dometic WAECO CoolMatic CRX 110 my thoughts have changed considerably and it is extremely economical and I have tested it in 45c + temperatures. My generator was extremely helpful with any questions and the fridge arrived in Kalgoorlie the day after payment, so I definitely would recommend My Generator. 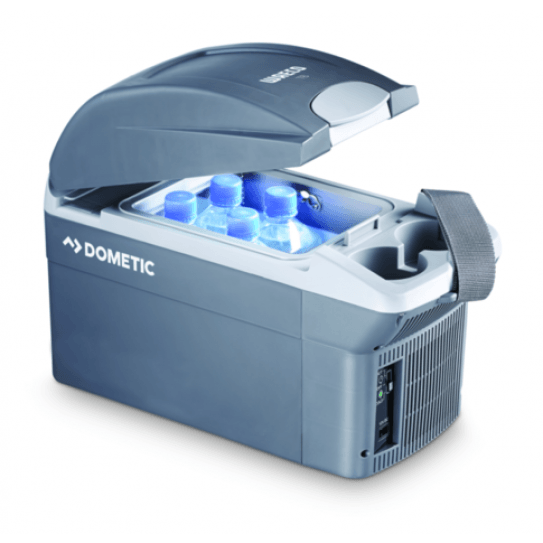 Currently FREE with the Dometic Waeco CRX110 Fridge is a Dometic 8 Litre Vehicle Cooler / Warmer! Dometic WAECO CRX110, CoolMatic built-in 108L refrigerator. A 2-Way Fridge-Freezer for 12 / 24 volts DC and 100-240 volts AC operation, designed for recreational vehicles. This latest CRX110 model replaces the previous Dometic Waeco CR-1110 model. The new CRX range has the same physical dimensions as the previous CR models, but slightly improved performance including; greater temperature control, reduced noise, and better energy efficiency. Full details outlined below. Plenty of online review for this unit, all positive and correct in putting out how great a unit this is. My Generator were brilliant to purchase from 5 star rating for them. Very quick delivery to Adel from Melb. This CRX110 fridge freezer nicely fitted in the space previously occupied by the RM2350 90 litre 3 way fridge in our Avan. Only had it a month so far but it works well on 12volts. We are happy with the greater capacity, although the door shelf could do with a couple of optional positions, or even the option of a second door shelf. The door opening latch works ok, but feels like it could break if not operated carefully. Pressing the door in a little while operating the latch makes it open much more smoothly. Our only concern really is that the specifications give the low ambient operating temp as +10°C. We 're in Qld, so yet to discover if the freezer keeps frozen below 10°C. No problems. Easy to order. It was shipped very quickly and very well packaged on a very strong pallet. I was looking for an upright fridge to use in my Ute back canopy. It had to fit into a specific space and offer good storage space. The CRX110’s height worked perfectly, and the 109 litres of storage space give me plenty of options for how to pack it. I do like the fixed freezer unit; good to know I’ve got a dedicated space for frozen items. Very happy with the purchase and both the price and delivery speed was second to none. Very easy to order and was able to supply and ship faster than anyone else in the market. I had an urgent need and they delivered. The fridge is a great addition to my camper. Performed flawlessly on consecutive 35+ degree days. Only bug bear is that for the money why don't dometic add a digital thermometer like their portable fridges. Standard shipping was fast and product was well packed. This is great replacement fridge for our van. Easy to install and fast to cool down. Also low on power usage. Great cooling power and easy to operate, you can set and forget. Only reason we replaced the 3way for the CRX110 was because of lost storage in the fridge due to the cooling elements, we can fit a 1/4 more into the new fridge! Runs over 3 hot days solid on a stand alone 110 amphr battery on the second cooling mode ( we put cold food in it first ). Would of liked to test it further but we moved camp so the car topped up the batteries on our travels. Once at the new camp we swapped onto the van battery with solar and had no worries in the back of my mind about running out of power. Over all a great investment for us. Simple, easy and straight forward using the checkout. It was exactly as I ordered. Very happy. I spoke to a person who gave me excellent advice. Great product easy to install, runs well and don't use much battery over 48 hours. Good the shipping was quick and packed well. This fridge is great. Easy to install and light weight. It keeps items really cold. The automatic switching from 12V to 240V also make it easy to manage your 12V power supply. Easy experience and fast shipping. The fridge is great fitted in space of old fridge and works really well and doesnt use as much power as the old fridge. should make for better operation at cooler locations.This unit replaced the previous model so no modification was necessary to cabinet and wiring etc in our Van. We are hoping for a good result from this unit. A Pleasure to deal with My Generator .The delivery was prompt ,the unit was well packaged and undamaged and the freebie was a bonus!!! Pricewise the unit was very competitive . Very happy...THANK YOU. Replacement item, works perfectly, easy to install (into boat), no problems with wiring, excellent low power consumption, adjustable shelves very usable, looks good. Great fridge, economical and reliable, fits the space perfectly, and works much more efficiently than a 3 way gas fridge. Love new fridge / freezer. Just returned from our first trip with this installed. Never a problem, wine stayed cold - ice in freezer, even after 7 hour drive and operating on solar. Great price, all fixtures are of good quality. very happy! Wow - Order one day received 2 days later - and a bonus car fridge thrown in, how could I not be happy. We purchased the dometic waeco upright for inside the canopy of our camping Ute - it's fantastic! Works like a charm and fits plenty of food including icy poles for the kidlets. Love it! Purchasing from my generator was hassle free. Items were shipped and here within in the week. 5 stars! Wouldn't hesitate to purchase from them again! We love this fridge! Automatic 12v to 240v changeover. Low power draw on 12v and heaps of room for the beer! Outstanding service and prompt delivery! Got a freebie also which is nice! First up service from the my generator people is a1 .very helpful .the crx 110 fridge seems to be great value and so far the power usage on the 2nd highest setting is brilliant doesn't look to use any more power Than my cfx 40 . Great faultless experience. Easy to deal with and fast response with any answers. I bought this to replace my RM2350 unit which was 15 years old. The CRX110 is almost identical in size and was very easy to install. The temperature dropped to 3 degrees after only a couple of hours on 240v. Have not tried on 12v yet but don’t envisage any problems. The compressor is so quiet I had to put my ear against the fridge to hear anything. Extremely happy with the price and delivery speed from Mygenerator. Easy to install and operate, works well, great replacement for RM2350 3-way fridge/freezer. Good service, prompt delivery as promised! Product is excellent and great price. Easy to install. Dealing with My Generator was great they helped me in every way. Delivery was very fast and to my door. Great replacement for 3 way RM8501 in our motorhome. 3 way on gas just didn't cope above 32 deg in Australian summer. I had previous experience with a CR1140 so went that way, have plenty of solar power so no more switching between gas and 240v. Easy to purchase but freight was a little slow, Company seemed good to deal with. The fridge looks good is easy to install and works brilliantly, 200% better than the 3 in 1 that it replaced. Great deal, great price and great delivery. It was my fist time using " My Generator " and looking forward to using them again, well done and thank you. I installed the CRX110 in my caravan and have just returned from a trip with the van. The Fridge worked great and kept the produce refrigerated in transit. My caravan battery system coped excellently whilst keeping the fridge at the correct temperature. I have no regrets buying this Dometic WAECO Frige/Freezer. Great value for money and an excellent product. My Generator provided a quick and easy service delivering the Fridge in only a few days. Very pleased with the service. Easy to install. Quality product and power efficiency. Professional staff and knowledgeable about product. Our previous fridge failed just before leaving for a trip. Search on line revealed My Generator not only had our model CRX 110 Dometic/Waeco, but it was at the most competitive price. Fitting was a breeze as my husband had the unit fitted and working perfectly within a few hours. Thank you all at My Generator for fast,helpful service. Staff went the extra mile for us,thank you so much,the time it took to deliver to a rural address in F.N.Q. was fantastic, well done. Great Fridge easy to install and operate. This is the first time I have used the My Generator site to purchase anything it is a great site easy to navigate all the product information is there, communication was excellent postage was fast and no hassles would highly recommend this site. I have only just started using the fridge, everything is working great. Could not recommend Mygenerator enough. Service whilst deciding on which fridge to choose was excellent. Postage was unbelievably quick, I ordered and paid on the Monday and the fridge arrived two days later, I live in regional Western Australia. I bought the Waeco Caravan / Boat fridge with the installation kit. It was a fantastic purchase process and was very easy to use. It arrived promptly and I was very happy with the bonus Cooler bag. Very happy with the service, and the price was the cheapest I could find. As requested, so far my experience in a month or so of ownership of the CRX 110 has been excellent. The unit is so quiet and low in battery consumption. The staff at My Generator were very helpful in several phone calls and the product was delivered in a matter of only a few days in WA. Very efficient low power consumption unit. Works great from solar panels with stylish finish. The fridge & freezer unit is outstanding after replacing the original 3 in 1 unit. Great service & communication. A very happy satisfied customer. Great Fridge, but would ideally like to have a similar fridge with a bigger freezer . Inefficient operation forcing the user to search for either a 240 outlet or starting the gas up each time they stop. It gives me confidence that I won't end up with a flat battery and don't need lots of solar panels to keep it running for ever. It really has made our holidays a stress free experience. Love the product well done to the creators. Easy and clear to follow instructions to pruchase online items. The fridge is easy to install and works well. Much better than the 3 way Dometic it replaced. The experience with My Generator was excellent. Easy to arrange purchase at a competitive price match, good knowledge about product and prompt delivery. Fridge works exceptionally well even in 30+ temperatures running on 12v. Fridge was easy to install - very happy with product. Very happy with the service -quick delivery and well packaged. Best money ever spent, excellent service, speedy delivery. Not a issue in the world. did done do good my generator. Fridge fitted perfectly. Slid the old 3 way fridge out and the new unit in. Two electrical wires together and I was ready to go. Maybe still a bit expensive but this mob was the cheapest I can find including delivery. Fast delivery. Online chat was a big help to find the right fridge to replace my old 3 way fridge. Light weight ,easily handled, a breeze to install and works like a charm. Previously we had another well known brand that was so noisy I have to keep checking if the Waeco is running. I placed the order online Monday PM, the refrigerator arrived on my doorstep at 4:00 pm on Wednesday . Fantastic service, great price, and I received a 22L cool box as well. Excellent. Simple process. No problems and the fridge was packaged and shipped really well, not just an appliance in a box. It arrived firmly strapped to it's pallet. Pleased with the product fitted into the opening and screwed into the side with out having to use a frame. The fridge works very well , and uses considerably less power than the previous one, I was very impressed by the speed of delivery, I ordered it on a Monday , and received it 2 days later on Wednesday. Impressive ! Very happy, already installed in my caravan and running to-day! What fantastic service, ordered fridge on Monday evening and delivered to door on Wednesday afternoon at 4: 15 pm. Thank you,thank you, thank you. I will certainly use and recommend your company to anyone who asks. Regards - Richard Helsdon. Great product, easy to install and use. If I can do it, anyone can. Was great to talk to a real person, not just using emails back and forth. Will definitely use this company for any future purchases. The fridge is very quite and users much less power than the last model. Fantastic response to my emails and direct conversation. Had to have the fridge delivered to the centre of Australia without any effort and arrived in three days with no shipping charges. Top shelf (blue) cover easily damaged when shutting door, is it really necessary? Second shelf in door should be about 3 inches lower and about 1 inch deeper to be more useful. i.e. store cans. Delivery in 3 days, all good. Glad I made this purchase, regards John. For the size of this fridge its heaps bigger internally than our old three way and handles the heat up here. Very cheap, good quality and del was fast! This product is very reliable and excellent value for money. Extremely easy to install. I have no issue promoting this product to my peers. The product arrived in 3 days which is excellent. The price and customer service from My Generator s second to none. The Waeco is an excellent product. Easy to install and was operational immediately. The look of this fridge is very sleek and easy on the eyes. Adjustable shelving throughout lends itself easily to personal choice of placement. Very pleased with it. Purchasing this product online was seamless and hassle free. Communication via the chat messenger on MyGenerator online page made things very easy. Delivery was very quick: within 3 days and the appliance was installed and operational immediately. The professionalism and courtesy of the staff at MyGenerator installs confidence that they stand behind the products they sell making this a very comfortable experience. Outstanding service. Review by Michelle Fowler	, Donnybrook W.A. We are so happy to have upgraded to this model fridge. No more hassels with gas running out. It runs smoothly and doesn't seem to struggle in the warmer weather like our old fridge. Fridge is as described has auto switch between 12v / 240v fits original 3way fridge space with mm to spare on sides nice looking unit. Temperature selection is by button selection in 4 increments instead of dial selection. Think I would prefer the old dial selection where you have greater control over temp. Very quiet. Fridge arrived in 48hrs. Unfortunately it was damaged in transit and as it was after closing time I emailed photos through to customer service. I was contacted the next morning by Paul who arranged a replacement which arrived the following week. No hassles just great service. Great replacement for the old Electrolux RM350 in the caravan, same size, fitted straight into the space. Fridge was cold within 15 minutes on low. Great presentation, lightweight and using the standard frame looks a treat. Ordered the product at 7.15pm Sunday & received it 12.00am Wednesday. Well protected, no dings or scratches or hassles, couldn't be happier with the service. I chose this product to replace the old fridge in my motorhome and was very pleased with the ease of installation. This fridge is very roomy and functions extremely well even in very hot conditions without too much strain on my battery as I mainly rely on solar energy. I will be more than happy to recommend the Waeco Coolmatic to all of my travelling friends. My Generator were a pleasure to deal with. They met my needs and answered my queries and the prompt transport and delivery of my fridge was much appreciated. I will certainly recommend them to anyone requiring anything from their extensive range of products. Great replacement fridge for my boat with stylish appearance, both inside and out. Nice having an interior light and easy controls over temperature, which can't be accidentally altered ! Very easy to deal with! My questions were answered, delivery was quick. Best price I could find on internet! Love my new fridge has all the features I wanted, auto change over great and so simple. Staff were very helpful, made a few queries before purchasing which only confirmed our choice. This is a great fridge,it is installed on my boat in place of a '3 in 1', power consumption is much less and after switching on the freezer was very cold only after 20 mins of operation. My only complaint is that one of the LED globes is not working but I can live with that. All done online over Xmas period, delivery was quick, cheap and no damage, impressed! Pleased with the fridge, working very well. Very easy to order & deal with. However I would suggest that the photos be updated to 'Australian' model or maybe the actual differences be pointed out. Although there is a 'Note' that pictures are of overseas model, the difference is extreme in my opinion which luckily we had picked up before ordering. e.g. pull out freezer in pictures was one thing we really liked, but the Australian model is not designed the same. If I had not realised before receiving our fridge I would have been disappointed on delivery. Works well. Could do with a rear mounting strip like the 3way dometic units. Prompt service, good support and prompt delivery. Easy purchase and my fridge was delivered next day to remote area and freight charge was very fair. I will recommend for fair price, great service, great delivery and very reasonable freight charges. Q:1) What is the thickness of the outside door (including the rubber seal)? 2) How long from payment to delivery to South Penrith NSW 2750? Hi - the thickness of the door including the rubber seal is approx. 60mm. Once payment is received, you can allow 1-2 business days to arrive at your address in Penrith, NSW. Q:In reference to Waeco CR-1110 Fridge: 1) Is this fridge different than the CR-110 model? 2) Is the compressor a Secop Model Number: BD35F? Hi there - yes, the CR-1110 supercedes the CR-110, and now operates on 240Volts as well, without requiring an extra adaptor. Relating to the compressor, it is a Secop Model BD50. If you need to consider larger or smaller 3-Way Absorption Fridge-Freezer models, you can browse our full range HERE. Thank you. Q:Can you please give me the coverage and the dimensions of the Dometic Waeco Standard Installation Frame CR-110-EST? Q:On the Dometic CRX110, when the temp drops below 16 deg C does the winter function kick in automatically of do you need to select? Hi there, the Winter Kit/LAC function is built into the Dometic Waeco CRX110 & CRX140 models. These two CRX models have a permanent freezer (the 3 smaller CRX models have a removeable freezer). The LAC winter mode ensures automatic optimum operation at ambient temperature of below 16°C. Q:Does the fridge require a fuse on red circuit between fridge and battery? Q:I'm fitting a new crx110 108litre frig I have removed the tabs inside the frig but there are no screw holes is it ok to to screw from the inside through the outside insulation to secure frig? There are no holes pre drilled in the fridge. Dometic recommend drilling a hole no larger than the size of the screw that you will be using to secure the fridge.